Spring Style Challenge - round 2! 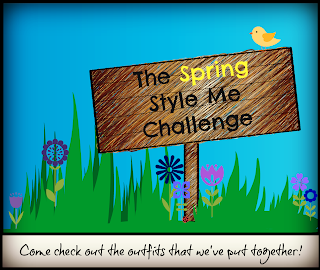 Once again, I'm participating in the Spring Style Challenge. Similar to previous challenges, I will be linking up with other challenge participants on Wednesdays during the challenge so you can see how we've all interpreted our outfits! AND we welcome you to link up your outfit(s) from the past week as well. Make sure you that come back for Friday's linkup post because not only are we linking up out top 3 looks/pieces/outfits etc BUT we are also doing a GIVEAWAY!!!!! Don't forget to check out how the other ladies interpreted the outfits (you know, for the non-maternity versions!) and link up with us! You look adorable in both of these looks! Love the cobalt jeans and white jacket! I love both of these looks. What a cute little baby bump too. You and your bump look great. Pregnancy looks good in you! lol thanks, nice to hear when I'm feeling so round! Like I said before, you are too cute :) Love the first out especially. Glad that you still joined in on the fun, and are putting a maternity spin to it. You look great in these outfits! And I love that you are giving the maternity perspective! maybe it'll help some other style-challenged mom-to-be! You look beautiful in both outfits! Love the dress in stripes, so cute and summery. I think you styled these perfectly for the bump! You are a very stylish mom to be. Goodness you are cute pregnant and have I not seen a pic of you in awhile? Baby has really popped! So exciting. Love that b/w dress on you with the denim jacket and the cobalt blue skinnies!! Love your white denim jacket! I let go of one a couple of years ago and of course now I'm kicking myself! You are my inspiration for colored jeans - and obviously for dresses with leggings! Looking adorable! lol and who would have known that prior to last year I was terrified of colored pants! I really like that white denim jacket and just saw it at Joe Fresh the other day....now to find me some Shaunacey coloured pants and we could really be style twinnies. Love your maternity spin!! You are just the cutest ever pregnant lady!! thanks, I love hearing that because I feel very un-cute a lot of the time! Gotta love a good denim jacket! Love both of yours! I'm so thankful I can still wear them pregnant! I love that you are doing this pregnant! I was pregnant last year for the Spring and Summer one so saved them for later. I think you are adorable styling that little bump! Wow you are rocking that glow & bump! This is such an awesome giveaway - thanks for leading me here via your sweet comment in mine! thanks so much, good luck in the giveaway! From the first challenge, I have always loved your looks. 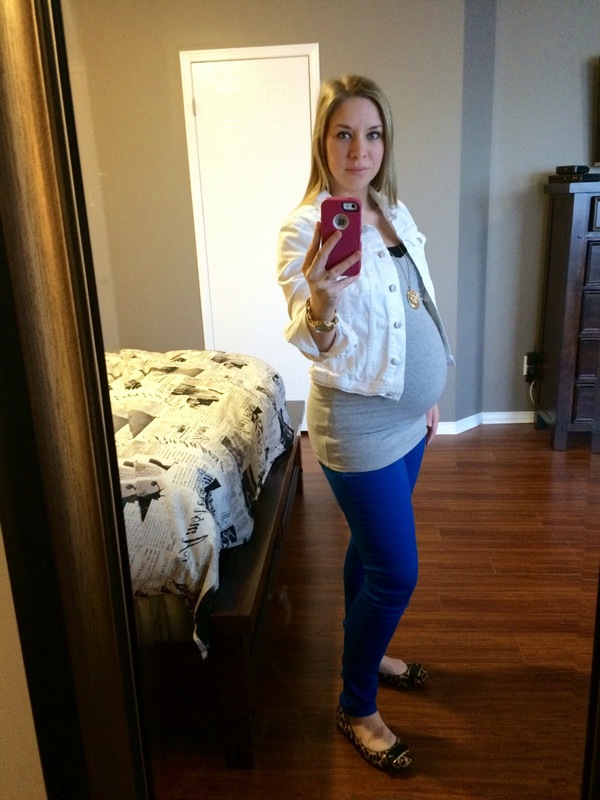 The baby bump only makes your style better my friend! oh thank you! And you know, I'm a big fan of all your looks! Aww your bump is adorable!